According to several reputable sources, the overall percentage of people with any disability has NOT changed much over the last 10 years. This is a far cry from what we read every day about Autism. Almost every news story I read in regards to Autism spits out statistics highlighting its sudden rise, and it is terrifying everyone. Why is no one talking about the possibility that Autism has been prevalent all along and that professionals were just unaware, dare I say, uneducated in the arena of Autism? Less than 70 years ago, doctors were recommending institutionalizing children with Autism-like symptoms as well as medicating and actually euthanizing these same individuals, with and without parent’s consent. The book, NeuroTribes by: Steve Silberman, devotes an entire chapter to these occurrences. The history above paints a clear picture of our lack of knowledge, misdiagnosis, and mistreatment of individuals with Autism until just a few decades ago. Now, let’s look at the recent statistics. The United States Census Bureau shows that the percentage of people, all ages with any disability, was unchanged from the 2005 to the 2010 census, seen in the table below. 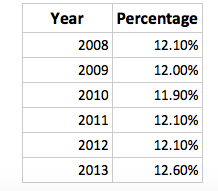 (http://www.census.gov/people/disability/publications/sipp2010.html) Both remain at 18.7%. If Autism is really on the rise as much as we hear it is, those numbers should have jumped drastically. This points to the fact that maybe Autism has been around, just hidden behind the misdiagnosis of other disabilities. Add to this, Cornell University, using the CDC’s findings, shows that the overall percentage of non-institutionalized persons, “male or female, all ages, all races, with all education levels in the United States who reported a disability” has stayed fairly consistent over the last 5 years. I have created a table below to show the findings. You can also access them here: https://www.disabilitystatistics.org/reports/acs.cfm?statistic=1. Again, if Autism is really on the rise, wouldn’t the percentage of all disabilities have increased drastically? 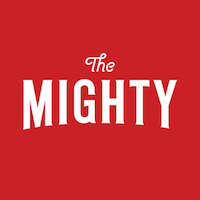 I believe this once again points to the fact that Autism has been lurking under misdiagnoses and incorrect classifications; with the correction of these errors, we are seeing a huge increase in awareness not prevalence. Can professionals attribute this influx to the amendment of these mistakes instead of pointing the blame at parents for the rise? I say this as most studies use parents as the scapegoat for the cause of their child’s Autism. Instead of recognizing these corrections, the media is fear-mongering with statistics and quotes that are down-right terrifying when isolated from the big picture. Autism Speaks says this about Autism: “Autism is one of the fastest-growing developmental disorders in the U.S.” (https://www.autismspeaks.org/what-autism/facts-about-autism), but is it really? Should it read: Our awareness of Autism is growing at a rapid rate or The reclassification of disabilities into Autism is fast-growing? 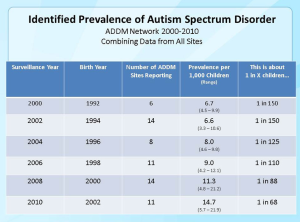 The graph below from the CDC, Center for Disease Control and Prevention, shows phenomenal, fear-inducing increases in the number of Autism cases over the last 10 years, but the CDC also states: “About 1 in 6 children in the United States had a developmental disability in 2006-2008.” (http://www.cdc.gov/ncbddd/autism/data.html) This daunting number of disabilities as a whole, 1 in 6 children, seems to be shadowed by the 1 in 68 number we hear daily about Autism. 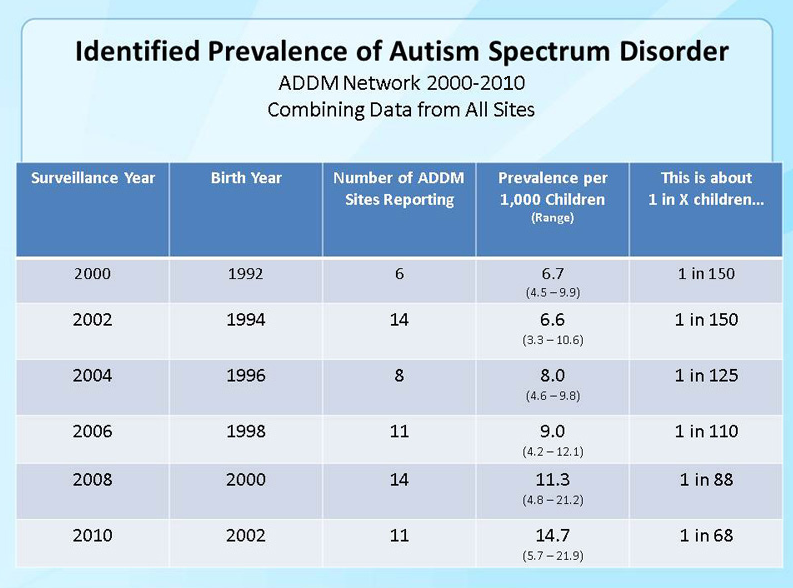 So I ask you again, is Autism really on the rise, or has it been lurking under misdiagnosis and lack of knowledge? Why can’t anyone admit that Autism has been a sleeping giant, and we are just now realizing its vast existence? Do not get my wrong here. I love the attention on Autism and all the research behind it, but I feel that if we shared the fact that disabilities as a whole have not increased, we can finally admit that Autism is genetic and has been around for centuries. We can stop placing blame on the parents who are already burdened beyond belief. We can also focus research on improving the quality of life for individuals with Autism instead of grasping at straws to find reasons to blame the parents. Can we take a look at this? Why is no one talking about these statistics? Am I missing something? Please share to spark the conversation and spread awareness.